On successful completion of all the prescribed papers and qualifying for the Degree, the provisional Certificate will be sent alongwith the final statement of marks directly to the students by the Controller of Examinations. Application forms can be obtained from the Enquiry counter of the Controller of Examinations Section.Amount to be paid is mentioned at the back of the application form. Mode of payment may be either Demand Draft of any Bank or Challan from BANK OF INDIA. If the payment is to be made by Demand Draft then it should be drawn infavour of "The Registrar, Bharathiar University" payable at Coimbatore. Certificates to be enclosed and application forwarding details are available at the back of the application form. Application along with the enclosures if any, should be sent to the Controller of Examinations. Certificate will be sent by Registered Post to the address given by the candidates within a month. Students who have obtained the provisional certificate may obtain consolidated statements of marks, degree certificate and migration certificate (if required) by applying to the Controller of Examinations, in the prescribed forms alongwith the requisite fee. Degree certificate of successful students can be obtained from the Controller of Examinations, by applying in the prescribed form alongwith the requisite fee. Some Universities while admitting students insist on the production of Migration Certificates. Students of School of Distance Education who require Migration Certificates are requested to apply for the same in the prescribed application form, with the requisite fees, to the Controller of Examinations, Bharathiar University. In case any certificate issued either by the Director, SDE or the Controller of Examinations has incorrect information or spelling mistakes, the same should be brought to the concerned officer within 10 days of the receipt of the concerned certificate or document. Belated request for correction, may entail payment of penalty fees. Duplicate copies of statements of marks, consolidated Statements of Marks, Provisional Certificate, Degree Certificate Migration Certificate, etc., may also be obtained by applying to the Controller of Examinations Only and Not from the School of Distance Education. Students enrolled in off Campus Academic Study Centres shall contact the Co–Ordinator of the centre concerned for any information/clarification. 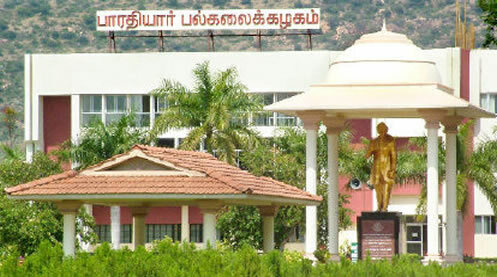 All disputes, that may arise in or from the affairs and administration of the SDE shall lie within the legal jurisdiction of the city of Coimbatore only. And as per statute 3 of Chapter III of the Statutes of Bharathiar University, January 1986. “In all suits and other legal proceedings by or against the University the pleadings shall be signed and verified by the Registrar and all processes in such suits and proceedings shall be issued to and served on the Registrar”. And whereas the School of Distance Education is an integral part of the University in as much as it has been established by the Syndicate of the University, the School shall come within the purview of the said statute.